In the aftermath of the Las Vegas mass shooting, there were widespread calls to ban "bump stocks," a device attached to a semiautomatic rifle to speed up the firing rate. A bump stock is a simple device that attaches to semiautomatic rifles, which normally shoot one round per trigger-pull, to speed up the firing rate by harnessing the gun's recoil to "bump" the trigger faster than the shooter would be able to with his or her finger. The device allowed the Las Vegas gunman to spray more than a thousand rounds from his perch in the Mandalay Bay Resort and Casino, killing 58 people and injuring hundreds. As soon as LaCroix realized bump stocks were implicated, he assumed they'd be banned. He even posted a video of himself giving his daughter Haley a chance to fire one "before it's too late." Almost a year later, he's still expecting the government to come for his bump stock. "Did I think after the shooting they were going to take them immediately? Yes. I'm surprised they hadn't done something earlier," he says. "Is it going to hurt my feelings if they take it? No. Do I think they should take them? No." Bump stocks are now illegal in some places. Ten states have passed bans or restrictions on the devices since the Las Vegas shooting. The Florida Legislature included a ban in its package of new gun regulations following the Feb. 14 massacre at Marjory Stoneman Douglas High School, in Parkland, even though a bump stock wasn't used in that crime. In Vermont, state police have offered to take bump stocks for disposal, ahead of a new ban that takes effect Oct. 1. But in most of the country, bump stocks are still legal and available for sale. The Bureau of Alcohol, Tobacco, Firearms and Explosives, the ATF, had already looked at the question of whether existing federal law banning machine guns also applies to bump stocks. It decided it didn't. After Las Vegas, there were calls for legislation that would clearly ban the devices, but that idea didn't go far in the Republican-controlled Congress. After the Parkland mass shooting though, President Trump appeared to weigh in against bump stocks. The NRA called for "additional regulations." So the ATF once again started the process of reviewing whether bump stocks should fall under the existing machine gun ban. During that review, the ATF received nearly 36,000 comments from the public, many from people who'd never heard of bump stocks before Las Vegas. One of them was Alia McCants, in New York state. She's troubled by the fact that her toddler-age twins already do active-shooter drills in preschool, and she told the ATF she sees no good reason for anyone to own a bump stock. "You're not going to shoot a deer 50 times in two minutes," McCants says. She's unmoved by the argument that bump stocks are mostly used for fun — just to experience the thrill of firing something that's close to a machine gun. "Is your fun worth someone else's life?," she asks. "And if not, let's take some reasonable common-sense measures to protect the lives of our kids and of each other." In practice, bump stocks are rare. Most recreational shooters consider the devices to be gimmicks — something that burns through a small fortune in ammunition while making the rifle jump around too much to aim properly. Nevertheless, many people wrote to the ATF to oppose the ban on principle. Michael Hammond, legislative counsel for Gun Owners of America, says he worries about what a bump stock ban could lead to. "Our question is whether or not this is an effort to go the back door and ban semiautomatics by regulation," Hammond says. Here's the thinking: A bump stock is very simple, mechanically. Some hobbyists have achieved the same effect with simple homemade devices — even a rubber band. And if that's all it takes, Hammond says defining bump stocks as illegal machine guns could mean that a future administration would interpret that to classify as a machine gun any semiautomatic with the potential of being bump-fired. He thinks that could be the first step in an end-run around the political decision in Congress not to ban semiautomatics. "If every time we don't like what the federal law does, but can't change it — we just throw the federal law in the trash can — you're going in a very dangerous direction," Hammond says. That argument gets no sympathy from gun control groups. "I think the gun lobby and gun extremists have to default to the slippery slope argument and just essentially scare people. Scare, you know, well-meaning, law-abiding gun owners into thinking there's going to be some dire consequence," says William Rosen, director of state policy and government affairs at Everytown for Gun Safety. Rosen agrees with many gun rights advocates on one point: Bump stocks, per se, are a relatively unimportant factor in gun violence. Las Vegas aside, they're rarely, if ever, used in crimes. "Prohibiting bump stocks is a very small part of the overall strategy to reduce gun violence in this country," Rosen says. But he sees the potential federal ban — which has the apparent support of President Trump — as a sign of a larger shift toward tighter gun laws. "I think it just indicated again where we are, politically," he says. It's been almost a year now since many Americans first heard the term bump stock. A reminder, this is that piece of hardware you can use to adapt certain guns to make them shoot faster, deploy more bullets. The Las Vegas gunman is believed to have used them on his rifles to inflict the most possible damage on that country music festival happening across the street from his hotel. At the time, there were calls for a bump stock ban. One year later, NPR's Martin Kaste follows up on where that stands. MARTIN KASTE, BYLINE: Right after Las Vegas, Jeff LaCroix decided he wanted to give his daughter, Haley, a chance to fire a bump stock before it was too late. JEFF LACROIX: Yeah. You've told me. She's like, I want to shoot it before - if they have to get rid of it, I want to shoot it before we have to get rid of it. And today we're going to do that. KASTE: LaCroix has a YouTube channel dedicated to outdoorsy pursuits in rural Louisiana, and he posted this video of himself and Haley six days after Las Vegas. She's grinning, a little nervous. Her ear protectors are decorated with freshly picked flowers. HALEY: Oh, my God. OK.
HALEY: It's fun. Oh, God. KASTE: LaCroix says it's just a thrill shooting something that's almost as fast as a machine gun. At the time, he was expecting bump stocks to be banned right away. Now a year later, he's still waiting. LACROIX: Did I think after the shooting that they were going to take them immediately? Yes. I'm surprised they haven't done something earlier, or tried to do something earlier. KASTE: What happened is this. Last fall, there were calls for federal legislation banning bump stocks, but that idea didn't go far in the Republican-controlled Congress. Then President Trump came out against bump stocks, and the Bureau of Alcohol, Tobacco, Firearms and Explosives started looking for a regulatory fix. 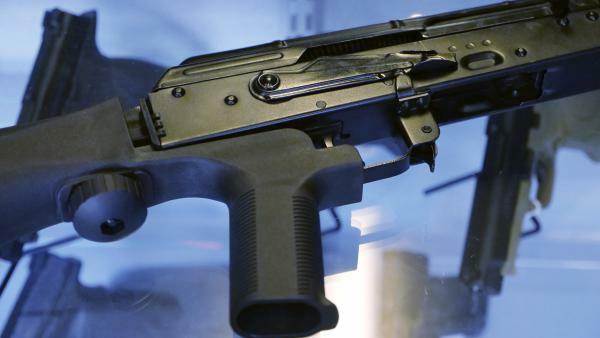 The ATF is now considering whether to define bump stocks and similar devices as machine guns, which would make them illegal under existing federal law. So far, the ATF has collected public comments on this, more than 35,000 of them. Alia McCants is a mother of young twins in New York, and she told the ATF that she saw no good reason for anyone to own a bump stock. ALIA MCCANTS: Is your fun worth someone else's life? And if not then let's take some reasonable, common-sense measures to protect the lives of, you know, of our kids, of each other. KASTE: The thing is, most avid shooters don't even want bump stocks, even for fun. The devices are generally considered a gimmick, something that makes a rifle jump around too much while burning through a small fortune in ammunition. Michael Hammond is the legislative counsel for Gun Owners of America. He personally has no interest in shooting with bump stocks, but still he's unhappy about the potential federal ban. MICHAEL HAMMOND: Our question is whether or not this is an effort to go the back door and ban semiautomatics by regulation. KASTE: And here's the thinking. A bump stock is a very simple thing, mechanically. It just uses the rifle's recoil, that jump as it fires, to pull the trigger again for you faster than your finger could. Some hobbyists have achieved the same effect with homemade devices. There's even a video of a man bump-firing his rifle with nothing more than a thick rubber band wrapped around the trigger. UNIDENTIFIED PERSON: That was 32 rounds bump-fired from the shoulder. KASTE: And if a rubber band is all it takes, Hammond says a ban on bump stocks could pave the way for a ban on any rifle that might be bump-fired this way. That argument gets no sympathy from William Rosen. He's with Everytown for Gun Safety. WILLIAM ROSEN: I think the gun lobby and gun extremists have to default to this slippery slope argument and just essentially scare people - scare, you know, well-meaning, law-abiding gun owners into thinking there's going to be some dire consequence. KASTE: While federal action is still pending, gun control groups are cheered by action at the state level. Rosen counts 10 states that have banned or restricted bump stocks since Las Vegas, and he sees a new willingness by states to step in where the feds won't. Not just on bump stocks but other gun issues, too, such as red flag laws, which make it easier for police to take firearms from people believed to be a threat. And in this larger arena of gun policy, Rosen does agree with the gun rights people on one thing - bump stocks, per se, are relatively unimportant. ROSEN: You know, prohibiting bump stocks is a very small part of the overall strategy to reduce gun violence in this country, but I think it just indicated, again, where we are politically. KASTE: Where we are politically is here - a gimmicky, rarely used rifle attachment that most people had never heard of before Las Vegas has now become a symbol for both sides in the American debate over guns.